Arrow is coming to an end. 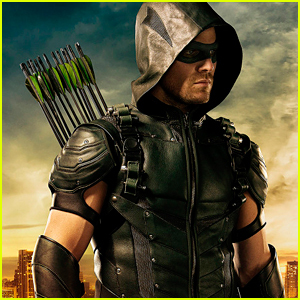 The CW’s longest-running DC Comics series – which premiered in 2012 – will wrap up with season eight, Variety reports. 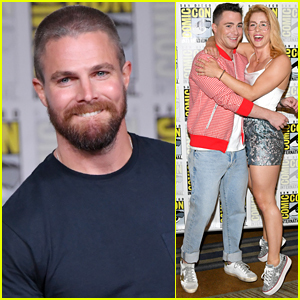 Stephen Amell is all smiles as he joins Arrow co-stars Colton Haynes and Emily Bett Rickards at the 2018 Comic-Con on Saturday afternoon (July 21) in the Hilton Bayfront in San Diego, Calif. The stars were joined at the event’s press festivities alongside fellow cast members David Ramsey, Echo Kellum, Rick Gonzalez, and Juliana Harkavy as they shared some details about the upcoming seventh season of their hit show. 'Arrow' & 'The Flash' Stars Film [SPOILER] Scene for Crossover Episode! SPOILER ALERT - These photos contain possible spoilers for the upcoming episodes of The Flash and Arrow, so continue at your own risk! Stephen Amell and Emily Bett Rickards share a romantic kiss while filming a scene for The Flash and Arrow‘s crossover episode on Tuesday (October 10) in Vancouver, Canada. Also spotted on set were Grant Gustin and Candice Patton and photographers on location say that the two on-screen couples were filming a double wedding scene on the waterfront! This isn’t yet confirmed, but it would be very exciting if this is indeed true. EPs Marc Guggenheim and Greg Berlanti both teased that the crossover would feature life events. The 'Arrow' Cast Shares a First Look at Season 6 - Watch Now! 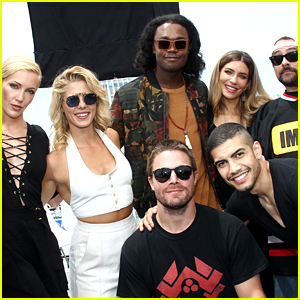 The cast of Arrow steps out to promote season 6 of their hit show at 2017 Comic-Con on Saturday (July 22) in San Diego, Calif. The cast – including Stephen Amell, David Ramsey, Emily Bett Rickards, Willa Holland, Echo Kellum, Rick Gonzales, Juliana Harkavy, and Katie Cassidy – were joined by moderator Kevin Smith to share a sneak peek at the upcoming season. During the discussion, Stephen shared an inside scoop of what his character Oliver Green is like as a dad. The cast and crew of the CW’s DC Comics-based Arrowverse series dropped a ton of upcoming spoilers at PaleyFest! Grant Gustin, Melissa Benoist, and Stephen Amell all took the stage at The Paley Center for Media’s 2017 PaleyFest presentation of The CW’s Heroes & Aliens held at Dolby Theatre on Saturday (March 18) in Hollywood. They were joined by their Arrow, The Flash, Supergirl, and Legends of Tomorrow cast mates David Ramsey, Candice Patton, David Harewood, Brandon Routh, and Caity Lotz, as well as moderator Kevin Smith and the shows’ executive producers. At the event, it was revealed that there will be a surprise crossover in the second-to-last episode of Legends‘ fifth season! FYI: Caity is wearing Thai Nguyen with Pedro Garcia heels.